London & Quadrant Housing Trust sent in planning applications to build more new homes than any other registered social landlord (RSL) last year according to exclusive new construction market research from Glenigan. The study, which covers detailed applications of 10 or more units submitted by RSLs during the 2018 calendar year, shows that London & Quadrant’s planning pipeline totalled 2,518 units. The organisation has the largest planning pipeline but the number of units that London & Quadrant sought detailed permission to build in 2018 shrunk by 8% compared to the total for 2017. This fall is reflected in a drop in the overall planning pipeline amongst RSLs fell as the focus shifted from new build to repairs in the wake of the Grenfell disaster. However, the number of units in London & Quadrant’s latest planning programme is still 52% ahead of the total for the 2016 calendar year before the Grenfell disaster, which occurred in June 2017. London & Quadrant’s focus remains on flats, which provided 61% of the units in the planning pipeline with the balance of homes being some form of house. Clarion was again in second spot. The group, which was created through a merger in 2017 between Affinity Sutton and Circle, applied to build 1,350 units. Of this total, 69% of the units were some form of house and the balance were apartments. At third-placed Catalyst the focus is exclusively on apartments, but 73% of the units in the planning pipeline at A2Dominion in fourth were also houses. Genesis was top in 2016 but drops to sixth after the group’s planning pipeline contracted by more than half. Overall, half of the top 10 RSLs had applied to build less units than a year earlier according to Glenigan’s construction industry analysis. The drop off in planning applications for new build residential projects by RSLs is also reflected in Glenigan’s annual ranking of the construction industry’s top 100 clients for 2018. Only two RSLs feature and just one is in the top 50. Clarion appears in 36th position after letting £176.7 million-worth of building contracts valued at £250,000 or more during 2018. The only other RSL in the latest top 100 is the Peabody Trust, which is placed in 81st spot after agreeing contracts valued at £94.7 million last according to Glenigan’s construction market research. In 2017, only one RSL – Notting Hill – was in the top 50, but Places for People, Orbit, One Housing and London & Quadrant all featured amongst the construction industry’s top 100 clients. In 2016, ten RSLs featured in the top 100 clients. 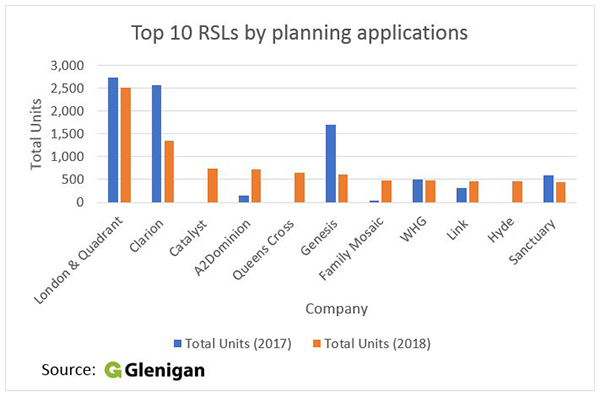 Glenigan’s construction market research suggests that RSLs look likely to remain scarce in the industry’s top clients in the near-term.